I'm totally with you, it's like adding insult to injury. Not only can you not have the sweet H6 anymore, you have to put up with an ugly black bar of shame on the back of your coxster now. It seems like 991.2 just came out and it's already yesterday's paper. Sometimes if yesterday's paper sucked, they have to push a new one out real fast before they start losing subscribers. 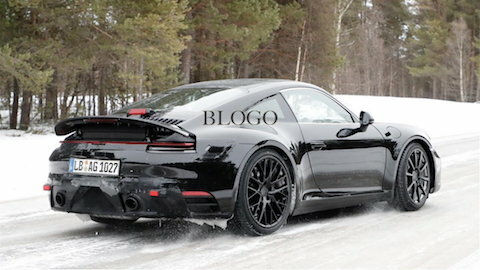 It's long been rumored that the 991.2 was going to be short cycled. GTS is out the first year. (albeit late in 2017 MY). Porsche needs a 911 hybrid. I'm pretty sure photos of the 993 have already leaked as well. Agreed except the fart can 3.0L turbo motor is likely to stay so, to continue your analogy, good luck with the content of the new article! Yes, give us the option of a 3.6 TT or 3.8 TT. Unless they want to take the 3.0L redline to 9000 rpm. Much easier to do with a 3.0 vis a vis a 3.8 or 4.0! That would be interesting! More importantly, what are the rumors on the engine? Most likely a carry over with slightly more HP? Maybe 440 hp in the S, just below the 991.2 GTS? There will be an optional hybrid model along with the other variants. They won't all be hybrids. Expect more Turbo charging. NA is dead in the street Carrera's and the GT cars don't have long either.